With the widespread use of contemporary ultrasonographic techniques in the obstetric period, congenital hydronephrosis has become the most common initial presentation of ureteropelvic junction (UPJ) obstruction. Prior to this, infants often presented with an abdominal mass, and children presented with abdominal pain, nausea, and vomiting. Hematuria and urinary tract infections are also not uncommon presenting symptoms. The application of radiographic studies, according to the pediatric urology paradigm, separates cases of congenital hydronephrosis due to UPJ obstruction from cases caused by other etiologies such as posterior urethral valves, megaureter, and vesicoureteral reflux. See the images below. 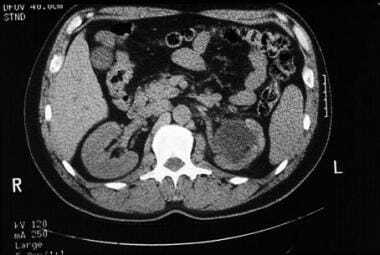 CT scan without contrast demonstrating severe left-sided hydronephrosis secondary to ureteropelvic junction obstruction. UPJ obstruction is the most common cause of prenatal hydronephrosis, accounting for 80% of the cases. Dismembered pyeloplasty has been the criterion standard surgical therapy for UPJ obstruction. In the 1980s, with the advent of percutaneous access to the kidney, antegrade endopyelotomy was developed as a less-invasive surgical therapy for UPJ obstruction. More recently, with rapid advancements in optics yielding smaller and more functional ureteroscopes, retrograde endopyelotomy has developed as an even more minimally invasive approach to treat UPJ obstruction. In addition, a retrograde approach using a balloon cutting catheter (Acucise) allows treatment of UPJ obstruction using only fluoroscopic guidance. The most recent advancement in treatment for UPJ obstruction is the development of the laparoscopic dismembered pyeloplasty. Urologic texts define UPJ obstruction as an impediment to urinary flow from the renal pelvis into the ureter, which may result in symptoms or renal damage. The problem that clinicians face with UPJ obstruction is determining when poor drainage of the renal collecting system jeopardizes the future function of the affected kidney and the patient's overall health. The answer to this question drives the urological workup of potential UPJ obstruction and results in the application of surgical techniques to alleviate the obstruction and preserve renal function. 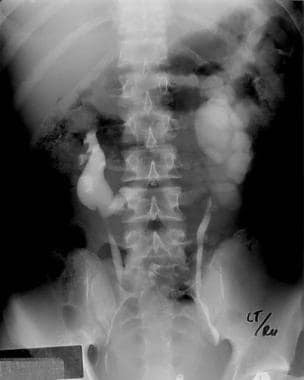 Obstruction of the UPJ is one of the most common congenital abnormalities of the urinary tract. Prior to the proliferation of prenatal ultrasonography, most cases of UPJ obstruction were not detected in the first year of life. The frequency of births with unilateral UPJ obstruction is estimated to be 1 case in 5000-8000 live births, and it is bilateral in 6% of these cases. Studies have indicated that UPJ obstruction is more common on the left side than on the right by a left-to-right ratio of 5:2 and that it is has a male-to-female ratio of 5:2. Another study found bilateral UPJ obstruction in 32 of 89 cases. This same study found that the diagnosis was made prenatally in 74 of 89 cases and that most patients diagnosed postnatally presented with an abdominal mass. Currently, the vast majority of UPJ obstructions (90%) are detected with prenatal ultrasonography. As many as 80% of children identified with prenatal hydronephrosis have no signs or symptoms of their urologic abnormality after birth. An epidemiological study of 11,986 pregnant women who underwent prenatal ultrasound evaluations demonstrated that the overall frequency of congenital abnormalities is 0.5% and that urinary tract abnormalities represent 50% of these cases. Furthermore, others have estimated that the etiology of prenatal hydronephrosis is UPJ obstruction in 50-67% of the cases. Taken together, this suggests that each mother who undergoes prenatal ultrasound examination has a 0.2-0.4% chance of having a neonate with hydronephrosis and these children have a 50% chance of eventually having the diagnosis of UPJ obstruction after birth. UPJ obstruction is associated with a number of anomalies. A known association exists between UPJ obstruction and horseshoe kidneys. UPJ obstruction has also been found to occur in 17 of 82 patients with ectopic kidneys. A strong relationship also exists between UPJ obstruction and nephrolithiasis. One study found a 20% incidence rate of stones in patients with UPJ obstruction. Finally, no strong evidence exists indicating a hereditary pattern. Only one study has suggested that UPJ obstruction has a genetic etiology,  and thus, most cases are believed to be spontaneous in nature. The etiologies of UPJ obstruction are numerous and are classified on an anatomic basis as either extrinsic or intrinsic. Intrinsic causes are inherent to the development and anatomy of the UPJ itself, while extrinsic causes are exterior to the UPJ. Additionally, UPJ obstruction can be classified as primary and secondary. Primary UPJ obstruction is thought to be due to developmental anomalies of the UPJ, while secondary UPJ obstruction is due to other causes, including previous surgery, recurrent stone passage, or infection and vesicoureteral reflux. Because the pathophysiology is enigmatic, the etiologies of UPJ obstruction are classified on an anatomic basis. Intrinsic etiologies are primarily due to insertional anomalies or functional abnormalities such as an aperistaltic section of smooth muscle. Studies have demonstrated abnormal collagen architecture within the stenotic UPJ. Another intrinsic etiology that has been described is tissue valves forming mucosal folds and ureteral polyps that may be due to anatomical abnormalities. As first proposed in 1894 by Fenger, these anatomic anomalies may obstruct the ureter at the UPJ in a ball-valve fashion during periods of diuresis. Insertional anomalies are described as cases in which the ureter inserts into the renal pelvis at a location that is not the most dependent. This prevents efficient drainage of the pelvis during periods of diuresis. However, whether this is the cause or the result of UPJ obstruction is not clear. Because the kidney is not fixed, except by its pedicle, UPJ obstruction can possibly cause dilation of the pelvis, resulting in distortion of the normal renal position and making the ureter appear to insert in an anomalous location. On the other hand, faulty embryogenesis of the renal unit may be the cause of the anomalous ureteral insertion. Some physicians have classified this cause as extrinsic because the pattern of volume-flow relationships across the UPJ is similar to the pattern of other extrinsic etiologies. Extrinsic etiologies of UPJ obstruction result from lesions that are anatomically exterior to the UPJ itself. These include aberrant or accessory blood vessels, scars from previous surgery, scarring from nephrolithiasis or infection, and other secondary causes such as vesicoureteral reflux. At the time of surgical repair, accessory vessels to the lower pole of the kidney or early branching of the segmental artery to the lower pole have been found to be associated with cases of UPJ obstruction. Because these vessels pass anterior to the ureter, distension of the pelvis during diuresis has been hypothesized to possibly cause the pelvis to displace anteriorly and hang over these vessels, which produces a kink in the ureter. This kink worsens as the process repeats itself, and the pelvis becomes progressively more hydronephrotic as the result of the developing UPJ obstruction. Previous surgery, nephrolithiasis, or infections that cause scars and fibrosis around the UPJ and resultant obstruction may also be extrinsic etiologies that trigger UPJ obstruction by the formation of bands of tissue that compress the ureter. Differentiating this from an intrinsic cause may be difficult because a UPJ obstruction may feasibly develop adhesions and scars from the UPJ obstruction, the stone disease, and infections that may follow. The cause of most intrinsic (or primary) UPJ obstruction likely relates to the embryological development of the urinary tract. During the fifth week of gestation, the ureteric bud forms from the wolffian duct and invades the metanephric blastema to begin renal differentiation. The nephrons, in turn, induce the ureteric bud to further divide and branch, leading to the formation of the collecting system (including the UPJ). The aberrations of this developmental process must cause primary UPJ obstructions. For example, during development, the ureter is believed to become solid and then recanalize later. This is thought to occur mostly at the mid ureter. Incomplete recanalization has been speculated to possibly lead to UPJ obstruction. Additionally, smooth muscle differentiation begins in the bladder at 7 weeks' gestation and reaches the upper ureter by approximately the 16th week. An abnormality in smooth muscle development may lead to a section of ureter that does not appropriately contract and, thus, also to primary UPJ obstruction due to poor peristalsis. The notion that vesicoureteral reflux can lead to progressive pelvic dilation and, eventually, UPJ obstruction, is logical. Although an association exists between UPJ obstruction and vesicoureteral reflux, no causal relationship has been identified. In a large retrospective review, no increased risk of UPJ obstruction was associated with all grades of vesicoureteral reflux. A 5-fold increased risk of UPJ obstruction existed in patients identified to have grade 5 reflux. The same review demonstrated that of patients with vesicoureteral reflux, only 3.6% also had UPJ obstruction. This small percentage does not support vesicoureteral reflux as a causative etiology of UPJ obstruction. Moreover, the same review demonstrated that when UPJ obstruction is repaired prior to the repair of vesicoureteral reflux, the UPJ obstruction does not recur. If vesicoureteral reflux were a causative etiology of UPJ obstruction, this would not be the case. UPJ obstruction occurs most often in children but may present in persons of any age. The clinical presentation of UPJ obstruction has changed dramatically because of the widespread proliferation of prenatal ultrasonography. Prior to this change, most children presented with an abdominal mass or urosepsis. In this age of ubiquitous prenatal ultrasound, the vast majority of patients with UPJ obstruction present with prenatal hydronephrosis. Clinical symptoms of UPJ obstruction later in life include urosepsis, failure to thrive, flank pain or mass, and hematuria. As first described by Dietl, the episodes of flank pain, nausea, and vomiting may manifest during periods of rapid diuresis with large volumes of liquid intake (so-called Dietl crisis). This may only manifest after drinking liquids that promote a brisk diuresis such as beer or coffee. In adults, one study demonstrated that the most common presenting symptoms are flank pain (77%), nephrolithiasis (20%), microscopic hematuria (16%), history of pyelonephritis (14%), gross hematuria (9%), decreased renal function (9%), and gastrointestinal symptoms (5%). Hypertension may also be a rare presenting symptom. Once the diagnosis of ureteropelvic junction (UPJ) obstruction has been made, management of depends on the severity of the case. Indications for dismembered pyeloplasty or any other operative therapy are variable. Most clinicians consider the presence of symptoms from the obstruction, such as recurrent flank pain, nausea, and vomiting, to be indications for interventions. Other indications include recurrent urinary tract infections, pyelonephritis, ipsilateral nephrolithiasis, and deterioration in renal function. While performing an antegrade endopyelotomy, the inability to pass a guidewire through the strictured area is a contraindication to endopyelotomy. Additionally, a stricture longer than 2 cm is generally a contraindication to endopyelotomy. Some authors believe a crossing vessel is a contraindication to endopyelotomy because success rates are reportedly lower and bleeding complications higher. However, others have challenged these contentions and believe that if the incision is performed in a true lateral position, endopyelotomy is safe and has an acceptable success rate even in the presence of a crossing vessel. Uncorrected coagulopathy is a contraindication to surgical repair, and thus, referral to an internist or hematologist would be appropriate before undertaking surgical treatment. Helin I, Persson PH. Prenatal diagnosis of urinary tract abnormalities by ultrasound. Pediatrics. 1986 Nov. 78(5):879-83. [Medline]. Blanc T, Koulouris E, Botto N, Paye-Jaouen A, El-Ghoneimi A. Laparoscopic pyeloplasty on horseshoe kidney in children. J Urol. 2013 Oct 16. [Medline]. Naitoh Y, Kawauchi A, Kamoi K, Soh J, Hongo F, Okihara K, et al. Nephrolithotomy Performed Concurrently With Laparoendoscopic Single-site Pyeloplasty. Urology. 2013 Oct 19. [Medline]. Atwell JD. Familial pelviureteric junction hydronephrosis and its association with a duplex pelvicaliceal system and vesicoureteric reflux. A family study. Br J Urol. 1985 Aug. 57(4):365-9. [Medline]. Dietl J. Wandernde nieren und deren einklemmung. Wien Med Wochenschr. 1864. 14:153. Schuessler WW, Grune MT, Tecuanhuey LV, Preminger GM. Laparoscopic dismembered pyeloplasty. J Urol. 1993 Dec. 150(6):1795-9. [Medline]. Varda BK, Wang Y, Chung BI, Lee RS, Kurtz MP, Nelson CP, et al. Has the robot caught up? National trends in utilization, perioperative outcomes, and cost for open, laparoscopic, and robotic pediatric pyeloplasty in the United States from 2003 to 2015. J Pediatr Urol. 2018 Feb 22. [Medline]. Lantz AG, Ordon M, Pace KT, Honey RJ. Prone Versus Supine Lasix Renal Scan to Assess Surgical Success After Laparoscopic and Robot-Assisted Pyeloplasty. J Endourol. 2013 Oct 9. [Medline]. Ferroni MC, Lyon TD, Rycyna KJ, Dwyer ME, Schneck FX, Ost MC, et al. The Role of Prophylactic Antibiotics after Minimally Invasive Pyeloplasty with Ureteral Stent Placement in Children. Urology. 2015 Dec 9. [Medline]. Jabbour ME, Goldfischer ER, Klima WJ, et al. Endopyelotomy after failed pyeloplasty: the long-term results. J Urol. 1998 Sep. 160(3 Pt 1):690-2; discussion 692-3. [Medline]. Sundaram CP, Grubb RL 3rd, Rehman J, Yan Y, Chen C, Landman J, et al. Laparoscopic pyeloplasty for secondary ureteropelvic junction obstruction. J Urol. 2003 Jun. 169(6):2037-40. [Medline]. Basiri A, Behjati S, Zand S, Moghaddam SM. Laparoscopic pyeloplasty in secondary ureteropelvic junction obstruction after failed open surgery. J Endourol. 2007 Sep. 21(9):1045-51; discussion 1051. [Medline]. Moon DA, El-Shazly MA, Chang CM, Gianduzzo TR, Eden CG. Laparoscopic pyeloplasty: evolution of a new gold standard. Urology. 2006 May. 67(5):932-6. [Medline]. Alcaraz A, Vinaixa F, Tejedo-Mateu A, et al. Obstruction and recanalization of the ureter during embryonic development. J Urol. 1991 Feb. 145(2):410-6. [Medline]. Anidjar M, Mongiat-Artus P, Brouland JP, et al. Ureteral gene transfer to porcine induced strictures using endourologic delivery of an adenoviral vector. J Urol. 1999 May. 161(5):1636-43. [Medline]. Bauer JJ, Bishoff JT, Moore RG, et al. Laparoscopic versus open pyeloplasty: assessment of objective and subjective outcome. J Urol. 1999 Sep. 162(3 Pt 1):692-5. [Medline]. Bauer S. Anaomalies of the kidney and ureteropelvic junction. Walsh PC, Retik AB, Vaughan ED, Wein AJ, eds. Campbell's Urology. 7th ed. Philadelphia, Pa: WB Saunders; 1998. 1740-3. Bernstein GT, Mandell J, Lebowitz RL, et al. Ureteropelvic junction obstruction in the neonate. J Urol. 1988 Nov. 140(5 Pt 2):1216-21. [Medline]. Biyani CS, Cornford PA, Powell CS. Ureteroscopic endopyelotomy with the Holmium:YAG laser. mid-term results. Eur Urol. 2000 Aug. 38(2):139-43. [Medline]. Bomalaski MD, Hirschl RB, Bloom DA. Vesicoureteral reflux and ureteropelvic junction obstruction: association, treatment options and outcome. J Urol. 1997 Mar. 157(3):969-74. [Medline]. Brown T, Mandell J, Lebowitz RL. Neonatal hydronephrosis in the era of sonography. AJR Am J Roentgenol. 1987 May. 148(5):959-63. [Medline]. Canes D, Berger A, Gettman MT, Desai MM. Minimally invasive approaches to ureteropelvic junction obstruction. Urol Clin North Am. 2008 Aug. 35(3):425-39, viii. [Medline]. Catalano C, Pavone P, Laghi A, et al. MR pyelography and conventional MR imaging in urinary tract obstruction. Acta Radiol. 1999 Mar. 40(2):198-202. [Medline]. Clark WR, Malek RS. Ureteropelvic junction obstruction. I. Observations on the classic type in adults. J Urol. 1987 Aug. 138(2):276-9. [Medline]. Danuser H, Ackermann DK, Bohlen D, Studer UE. Endopyelotomy for primary ureteropelvic junction obstruction: risk factors determine the success rate. J Urol. 1998 Jan. 159(1):56-61. [Medline]. Desai MM, Desai MR, Gill IS. Endopyeloplasty versus endopyelotomy versus laparoscopic pyeloplasty for primary ureteropelvic junction obstruction. Urology. 2004 Jul. 64(1):16-21; discussion 21. [Medline]. Gill IS, Desai MM, Kaouk JH, et al. Percutaneous endopyeloplasty: description of new technique. J Urol. 2002 Nov. 168(5):2097-102. [Medline]. Gleason PE, Kelalis PP, Husmann DA, Kramer SE. Hydronephrosis in renal ectopia: incidence, etiology and significance. J Urol. 1994 Jun. 151(6):1660-1. [Medline]. Glenn JF. Analysis of 51 patients with horseshoe kidney. N Engl J Med. 1959 Oct 1. 261:684-7. [Medline]. Hanna MK, Jeffs RD, Sturgess JM, Barkin M. Ureteral structure and ultrastructure. Part II. Congenital ureteropelvic junction obstruction and primary obstructive megaureter. J Urol. 1976 Dec. 116(6):725-30. [Medline]. Johnston JH, Evans JP, Glassberg KI, Shapiro SR. Pelvic hydronephrosis in children: a review of 219 personal cases. J Urol. 1977 Jan. 117(1):97-101. [Medline]. Kass EJ, Majd M, Belman AB. Comparison of the diuretic renogram and the pressure perfusion study in children. J Urol. 1985 Jul. 134(1):92-6. [Medline]. Kim WJ, Yun SJ, Lee TS, et al. Collagen-to-smooth muscle ratio helps prediction of prognosis after pyeloplasty. J Urol. 2000 Apr. 163(4):1271-5. [Medline]. King LR, Coughlin PW, Bloch EC, et al. The case for immediate pyeloplasty in the neonate with ureteropelvic junction obstruction. J Urol. 1984 Oct. 132(4):725-8. [Medline]. Koff SA. Pathophysiology of ureteropelvic junction obstruction. Clinical and experimental observations. Urol Clin North Am. 1990 May. 17(2):263-72. [Medline]. Koff SA, Campbell K. Nonoperative management of unilateral neonatal hydronephrosis. J Urol. 1992 Aug. 148(2 Pt 2):525-31. [Medline]. Koff SA, Campbell KD. The nonoperative management of unilateral neonatal hydronephrosis: natural history of poorly functioning kidneys. J Urol. 1994 Aug. 152(2 Pt 2):593-5. [Medline]. Lechevallier E, Eghazarian C, Ortega JC, et al. Retrograde Acucise endopyelotomy: long-term results. J Endourol. 1999 Oct. 13(8):575-8; discussion 578-80. [Medline]. Louca G, Liberopoulos K, Fidas A, et al. MR urography in the diagnosis of urinary tract obstruction. Eur Urol. 1999 Feb. 35(2):102-8. [Medline]. Lowe FC, Marshall FF. Ureteropelvic junction obstruction in adults. Urology. 1984 Apr. 23(4):331-5. [Medline]. Maizels M, Stephens FD. Valves of the ureter as a cause of primary obstruction of the ureter: anatomic, embryologic and clinical aspects. J Urol. 1980 May. 123(5):742-7. [Medline]. Matsuno T, Tokunaka S, Koyanagi T. Muscular development in the urinary tract. J Urol. 1984 Jul. 132(1):148-52. [Medline]. Moore RG, Averch TD, Schulam PG, et al. Laparoscopic pyeloplasty: experience with the initial 30 cases. J Urol. 1997 Feb. 157(2):459-62. [Medline]. Niemczyk P, Krisch EB, Zeiger L, Marmar JL. Use of diuretic renogram in evaluation of patients before and after endopyelotomy. Urology. 1999 Feb. 53(2):271-5. [Medline]. Notley RG. Electron microscopy of the upper ureter and the pelvi-ureteric junction. Br J Urol. 1968 Feb. 40(1):37-52. [Medline]. Novick A, Streem S. Surgery of the kidney. Walsh PC, Retik AB, Vaughan ED, Wein AJ, eds. Campbell's Urology. 7th ed. Philadelphia, Pa: WB Saunders; 1998. 1743. Park JM, Bloom DA. The pathophysiology of UPJ obstruction. Current concepts. Urol Clin North Am. 1998 May. 25(2):161-9. [Medline]. Patel V. Robotic-assisted laparoscopic dismembered pyeloplasty. Urology. 2005 Jul. 66(1):45-9. Platt JF. Urinary obstruction. Radiol Clin North Am. 1996 Nov. 34(6):1113-29. [Medline]. Recker F, Subotic B, Goepel M, Tscholl R. Laparoscopic dismembered pyeloplasty: preliminary report. J Urol. 1995 May. 153(5):1601-4. [Medline]. Reddy PP, Mandell J. Prenatal diagnosis. Therapeutic implications. Urol Clin North Am. 1998 May. 25(2):171-80. [Medline]. Riehle RA Jr, Vaughan ED Jr. Renin participation in hypertension associated with unilateral hydronephrosis. J Urol. 1981 Aug. 126(2):243-6. [Medline]. Roarke MC, Sandler CM. Provocative imaging. Diuretic renography. Urol Clin North Am. 1998 May. 25(2):227-49. [Medline]. Schwartz BF, Stoller ML. Complications of retrograde balloon cautery endopyelotomy. J Urol. 1999 Nov. 162(5):1594-8. [Medline]. Segura JW. Antegrade endopyelotomy. Urol Clin North Am. 1998 May. 25(2):311-6. [Medline]. Shalaby-Rana E, Lowe LH, Blask AN, Majd M. Imaging in pediatric urology. Pediatr Clin North Am. 1997 Oct. 44(5):1065-89. [Medline]. Shalhav AL, Giusti G, Elbahnasy AM, et al. Adult endopyelotomy: impact of etiology and antegrade versus retrograde approach on outcome. J Urol. 1998 Sep. 160(3 Pt 1):685-9. [Medline]. Stephens FD. Ureterovascular hydronephrosis and the "aberrant" renal vessels. J Urol. 1982 Nov. 128(5):984-7. [Medline]. Takla NV, Hamilton BD, Cartwright PC, Snow BW. Apparent unilateral ureteropelvic junction obstruction in the newborn: expectations for resolution. J Urol. 1998 Dec. 160(6 Pt 1):2175-8. [Medline]. Tawfiek ER, Liu JB, Bagley DH. Ureteroscopic treatment of ureteropelvic junction obstruction. J Urol. 1998 Nov. 160(5):1643-6; discussion 1646-7. [Medline]. Thomas DF, Gordon AC. Management of prenatally diagnosed uropathies. Arch Dis Child. 1989 Jan. 64(1 Spec No):58-63. [Medline]. Thorup J, Pedersen PV, Clausen N. Benign ureteral polyp as a cause of intermittent hydronephrosis in a child. J Urol. 1981 Dec. 126(6):796-7. [Medline]. Turk TM, Koleski FC, Wojcik E, et al. Use of epidermal growth factor and collagen synthesis inhibition as adjuvant to healing of ureteroureteral anastomosis. J Endourol. 2000 Mar. 14(2):145-7. [Medline]. Wang Y, Puri P, Hassan J, et al. Abnormal innervation and altered nerve growth factor messenger ribonucleic acid expression in ureteropelvic junction obstruction. J Urol. 1995 Aug. 154(2 Pt 2):679-83. [Medline]. Whitaker RH. Clinical assessment of pelvic and ureteral function. Urology. 1978 Aug. 12(2):146-50. [Medline]. Williams DI, Kenawi MM. The prognosis of pelviureteric obstruction in childhood: a review of 190 cases. Eur Urol. 1976. 2(2):57-63. [Medline]. Disclosure: Partner received honoraria from Intuitive Surgical for speaking and teaching.